If I do a post on Friday, it’s usually because I have a weekend breakfast that I want you to make. There was that time I told you how to make eggs, biscuits and bacon; and let’s not forget these banana walnut waffles. This weekend, all you’ll need are a few stray Yukon gold potatoes, olive oil, salt, pepper, some slivers of garlic, finely chopped rosemary (use the fresh stuff) and a hard Italian cheese (Pecorino or Parmesan) and you can have this breakfast ready in no time. Do this: turn your oven up to 425. In a cast iron skillet, pour in a good, solid layer of olive oil–we’re talking like 1/2 a cup. (This recipe is very much based on New Yorker writer Tad Friend’s potatoes.) Cube your potatoes–4 or 5 large potatoes–toss them in that oil and season with lots of salt, pepper, finely chopped rosemary and 2 or 3 cloves of garlic slivered. Pop into the oven and listen; you should hear sizzling in a few minutes. Let them cook that way for 30 to 40 minutes, scraping them up every ten minutes or so and waiting for them to get crusty on the outside and soft in the middle (the best way to know is to blow on a piece and taste). When they’re ready, take them out of the oven and fry up eggs in olive oil. Get the oil hot in a nonstick skillet, add the eggs, lower the heat, sprinkle with salt, pepper, rosemary and fry until the whites are just set. If the whites around the yolks are still runny, cover the pan with a lid for 20 seconds or so until they’re set. 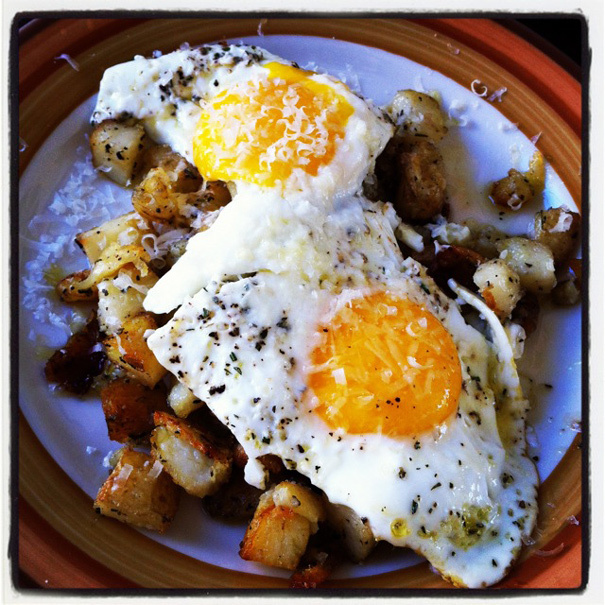 Scoop potatoes on to each plate, top with two eggs and–here’s the kicker–grate Parmesan or Pecorino over the top. Voila! A weekend breakfast for you to love. You can thank me on Monday.